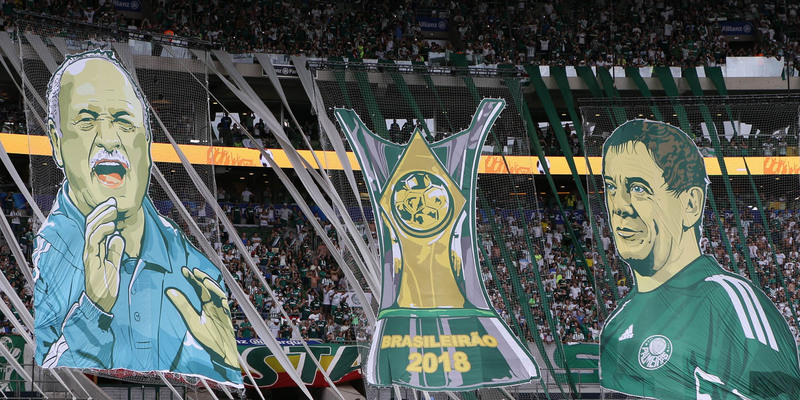 This latest title means that Palmeiras have now won a total of ten titles since 1959, compared to Santos’ eight titles, Corinthians’ seven, and Flamengo and São Paulo with six titles apiece. RIO DE JANEIRO, BRAZIL – This Sunday, December 2nd, Palmeiras lifted the cup of the 2018 Campeonato Brasileiro (Brasileirão) Série A championship after a measured 3-2 victory at Allianz Parque in São Paulo over nineteenth-placed Esporte Clube Vitória. A huge banner lifted in honor of the team’s head coach, Felipe Scolari, dominated the green-and-white stands this past Sunday matchday, photo courtesy of SE Palmeiras. Both sides started well, with Yago Rocha’s long-distance strike sent whistling past the Palmeiras goalpost after 14 minutes. The Verdão replied 7 minutes later with a cleverly-worked pass looped over the Vitória defence, only for Miguel Borja to volley the ball inches over the bar. After 43 minutes, Palmeiras’ first goal came when man of the hour Dudu whipped a curling cross into the area and Edu Dracena, losing his marker at the far post, nodded the ball in. The early second half was dominated by Palmeiras, with the team having a handful of chances to double their lead within the first couple of minutes. Their second goal finally came in the 57th minute, after some clever set-piece play followed by a bit of luck. Another assist for Dudu as he teed up Gustavo Scarpa to strike a bobbling shot along the turf towards the right of the Vitória keeper. The shot took a deflection from a Vitória defender, redirecting the ball under the goalkeeper’s gloves and into the back of the net. 68 minutes in and it was Vitória’s turn to be dealt a lucky hand, when a clumsy lunge from Antônio Carlos upended the sprinting Yago Rocha, leaving the referee no choice but to award a penalty to the embattled underdogs. With great composure, Yago Rocha sent the keeper the wrong way and slotted the ball firmly into the bottom right corner of the net. Vitória rallied and quickly scored another spectacular goal just two minutes after Yago Rocha’s penalty. However, Scolari’s men showed why they were destined to lift the cup by executing what looked like the simplest lay-up and strike in the dying moments of the second half. Bruno Henrique Corsini hit the ball with all the self-assuredness of a champion, and with that erased what was a spirited second-half display from the relegated Vitória team. After this victory, Luiz Felipe Scolari’s team closes the competition with 80 points, the same points with which they won the 2016 season. Second-placed Flamengo ended the season with disappointment after losing 2-1 to Clube Atlético Paranaense on Saturday in a game that saw both teams reduced to ten men.